Why does water volume decrease when salt is added? Why does water volume decrease when salt is added? Our teacher asks us in the class but I don't find any strong reason. What you are experiencing is the phenomenon of partial molal properties - components of a mixture contribute unequally to the properties of the mixture. Similar behavior is occurring in your sodium chloride and water system. Now, as for why these phenomena occur, a lot of it has to do with intermolecular forces. For example, you could consider that the hydrogen-bonding and dipole-dipole interactions between water and ethanol are perhaps stronger than between water and water or ethanol and ethanol. 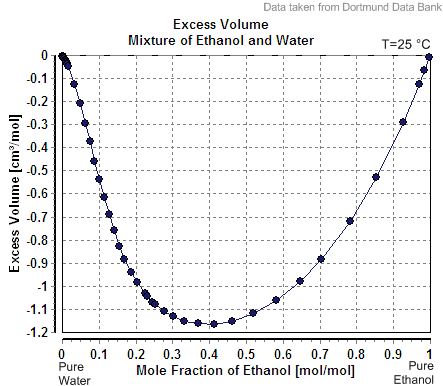 Additionally, water molecules are smaller than ethanol molecules. There is also a thermodynamic consideration. This state of affairs must represent minimum free energy (maximum entropy). How can you relate the interactions of sodium and chloride ions with water to the observation of negative excess volume? (Volume decreases so) shorter bonds between ion and water molecules Water molecules more tightly arranged/pack better/occupy less space Water molecules more ordered/ clustered (around the ions). Not the answer you're looking for? Browse other questions tagged physical-chemistry everyday-chemistry water or ask your own question. Does adsorption occur between liquids? Which of these compounds does not liberate heat when water is added to it? Why there is no change in water level when salt is added? Is there a soluble salt, or compound that when dissolved in water results in a solution with density less than pure water? How does changing volume affect concentration of solutions? Why does pool chlorine smell only when wet? Does the mass of sulfur really decrease when dissolved in water and increase when burnt? Why does pH decrease when diluting a base? Why don't we explode after drinking water?